Family Sleuther: Who Is Family Sleuther? 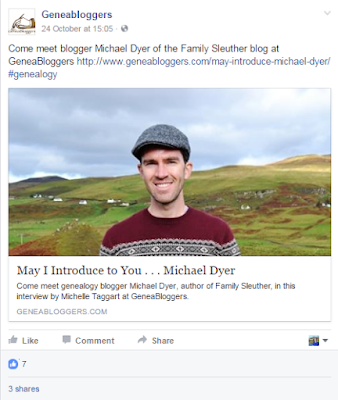 Interested in learning more about the blogger behind Family Sleuther (ahem... me)? I recently stepped out from behind the curtain and did an interview with Michelle Ganus Taggart about my genealogy background and how that spilled into blogging. The full interview is a part of the Geneabloggers May I Introduce to You series, which takes a closer look at the bloggers who make up the Geneabloggers community. Then be sure to come back and check out the blog. I want to hear what you think. Very Good Interview. Wishing you much success in your genealogical endeavors. I really appreciate the information you have provided me and always follow your blogs.